Who uses NASA Earth science data? Dr. Emily Berndt, to improve short-term forecasts of high-impact weather. Dr. Emily Berndt in the NASA SPoRT Visualization and Collaboration Lab. Behind her is a water vapor image of Hurricane Matthew coupled with CrIS/ATMS soundings. NASA photograph by Emmett Given, NASA MSFC. 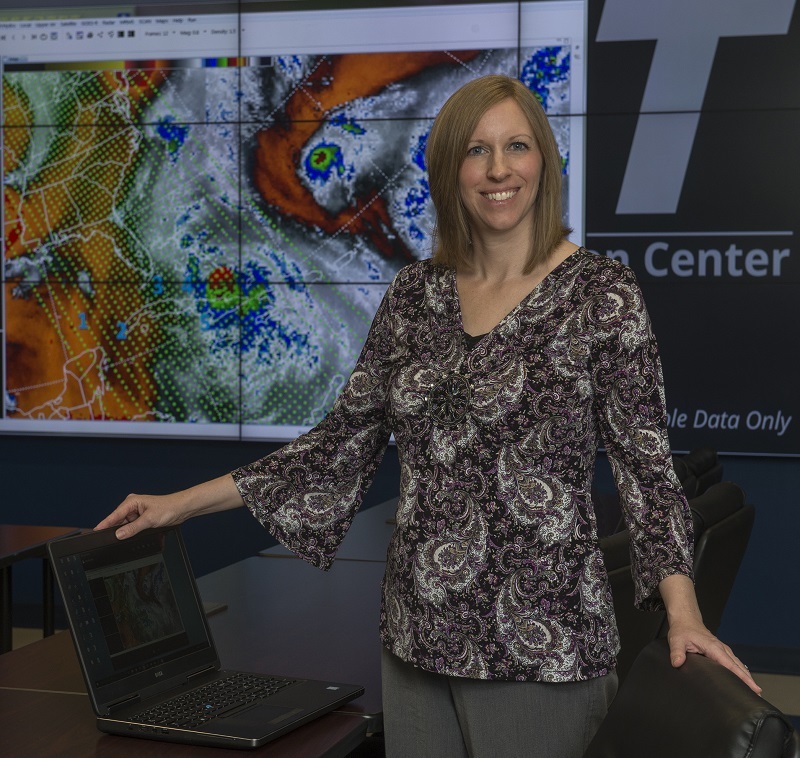 Research interests: Using satellite data to better understand the atmospheric processes leading to strong storms and using this knowledge to develop new forecasting products and new capabilities to display storm data. Research highlights: A ripple in the atmosphere off the northern coast of Africa on 22 September 2016 caught the attention of the U.S. National Hurricane Center. Using data from Earth observing satellites, aircraft, and ocean buoys, forecasters watched the disturbance churn westward across the Atlantic, absorbing warm, moist air as it slowly intensified. By the time the storm approached Barbados on 28 September, it was packing sustained winds of 39 to 73 mph and had developed a closed circulation. It was now a tropical storm, and given the name Matthew. Tropical Storm Matthew became Hurricane Matthew on 29 September as sustained winds increased to 74 mph. Suddenly, over a 24-hour period, the pressure inside the hurricane dropped rapidly, increasing the storm’s sustained winds from 80 mph to 165 mph. In the span of a day, Matthew became a Category 5 hurricane, the strongest storm possible on the 1-5 Category Saffir-Simpson Hurricane Wind Scale—a rate of intensification that rarely has been observed. The explosive growth of Hurricane Matthew is one example of cyclogenesis. Cyclogenesis refers to the general development or strengthening of a cyclonic system, such as a hurricane or other area of low pressure. Developing ways to use data from Earth observing satellites to better understand the atmospheric factors behind cyclogenesis and the rapid intensification of storms like Hurricane Matthew is one responsibility of the Short-term Prediction Research and Transition Center (SPoRT). It also is a key element of Dr. Emily Berndt’s research as a member of the SPoRT team. SPoRT, which is located at NASA’s Marshall Space Flight Center in Huntsville, AL, develops ways for the operational weather community to use satellite observations and research capabilities to improve short-term regional and local weather forecasts, and is jointly-funded by NASA and the National Oceanic and Atmospheric Administration (NOAA). From using data from NASA Earth observing satellites to improve soil moisture models in NASA's Land Information System to providing real-time lightning and storm data, SPoRT work and research encompass a wide range of activities. In her SPoRT research, Dr. Berndt relies on data from instruments aboard numerous Earth observing satellites, especially hyperspectral infrared sounders that detect radiated infrared energy. While humans can detect light in the visible band of the electromagnetic spectrum (human light sensitivity ranges from wavelengths of about 430 nanometers [violet] to about 770 nanometers [red]), hyperspectral infrared sounders detect radiated energy in hundreds to thousands of narrow bands across the infrared portion of the electromagnetic spectrum. One key hyperspectral sounder Dr. Berndt relies on is the Atmospheric Infrared Sounder (AIRS) aboard the Aqua satellite. The AIRS instrument by itself is best used in clear conditions, but when paired with the Advanced Microwave Sounding Unit (AMSU-A), which also is aboard Aqua, the combined instruments can be used to detect atmospheric variables in partly cloudy regions. Since clouds are mostly opaque in the infrared part of the electromagnetic spectrum and are largely transparent at microwave frequencies, the infrared + microwave AIRS/AMSU system provides data over a broad range of atmospheric conditions. In an early research project, Dr. Berndt used AIRS/AMSU atmospheric soundings of temperature, moisture, and ozone to investigate rapid cyclogenesis and the development of high-impact winds associated with intense low pressure systems developing in the North Atlantic Ocean. Her research was tied to understanding how AIRS/AMSU data can be used by forecasters at NOAA’s Ocean Prediction Center (OPC) to anticipate and more accurately forecast high winds with these events. NASA-funded research has shown that changes in atmospheric ozone levels are closely related to changes in storm intensity and the development of high winds that can threaten maritime activity. These ozone changes can be sensed by satellite-borne instruments in near real-time, meaning that ozone observations are available several times a day and can be tracked by forecasters. Building on this research, Dr. Berndt and her SPoRT colleagues developed an AIRS/AMSU total column ozone product that OPC forecasters can view using the National Centers for Environmental Prediction (NCEP) Advanced Weather Interactive Processing System (N-AWIPS). The AIRS/AMSU total ozone product evolved into an ozone anomaly product to give forecasters more certainty for identifying areas of ozone-rich air in the stratosphere that can drive rapid cyclogenesis and high wind events. 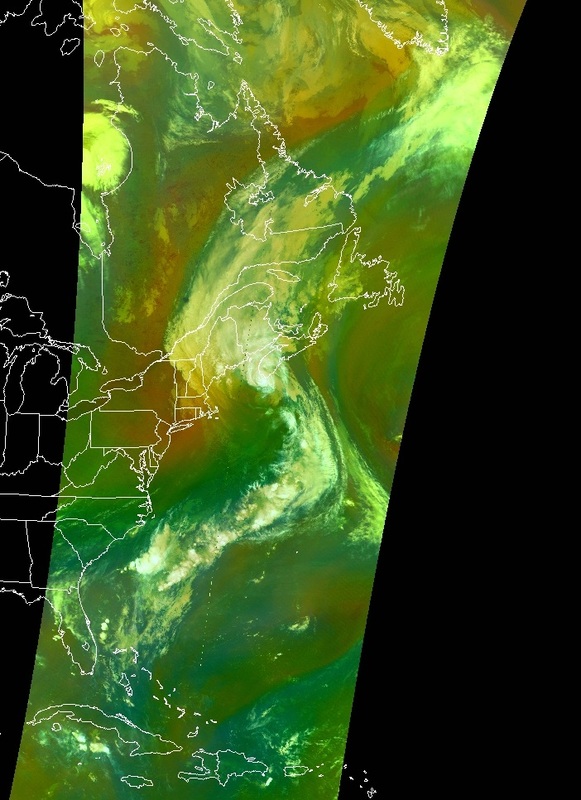 An Aqua MODIS Air Mass RGB image created during Hurricane Arthur on 5 July 2014. Regions of warm, dry, ozone-rich air that can be drawn into a storm and impact storm intensity are represented in orange (seen on left side of image). Image created at NASA MFSC by SPoRT using MODIS data from LANCE. Another forecasting product used by Dr. Berndt and her SPoRT colleagues in their research and real-time applications is the Air Mass Red, Green, Blue (Air Mass RGB) composite. Derived from data collected by the Moderate Resolution Imaging Spectroradiometer (MODIS) instrument aboard the Aqua and Terra satellites, the Air Mass RGB composite uses four MODIS infrared channels to characterize temperature, moisture, cloud cover, and large-scale features associated with air masses. The composite improves the detection of rapid cyclogenesis, localized areas of very fast moving air embedded in the jet stream (called jet streaks), and areas in the atmosphere that could impart spin on air masses and contribute to the development of cyclonic systems. Dr. Berndt used the Air Mass RGB and AIRS/AMSU products, along with water vapor imagery, to study the evolution of Hurricane Sandy (2012) and the processes controlling the storm’s movement out of the tropics and along the U.S. East Coast. With the launch of the joint NASA/NOAA Suomi National Polar-orbiting Partnership (Suomi-NPP) satellite in October 2011, Dr. Berndt and her colleagues were able to start using hyperspectral sounding data from the Cross-track Infrared Sounder (CrIS), which produces high-resolution, three-dimensional temperature, moisture, and trace gas profiles. Like the AIRS/AMSU instrument combination, CrIS can be paired with Suomi-NPP's Advanced Technology Microwave Sounder (ATMS) - which creates global temperature and moisture profiles - to more accurately detect atmospheric features in partly cloudy regions. The use of data from both the AIRS/AMSU and CrIS/ATMS instrument combinations provides not only more sensor overpasses to study high-impact weather events, but also additional data to forecasters. Dr. Berndt and her SPoRT colleagues applied lessons-learned from studying high-impact events (such as Hurricane Matthew) and storms like Hurricane Sandy to understand how hyperspectral infrared sounder data can be used to anticipate changes in hurricane intensity, which can occur when a hurricane moves out of the tropics and becomes an extratropical storm. Notable events such as Hurricane Sandy, Hurricane Arthur (2014), and Super Typhoon Atsani (2015) were studied to understand how hyperspectral infrared sounding data can be used to identify intrusions of dry air from upper levels of the atmosphere into a hurricane or typhoon, which can decrease storm intensity. The SPoRT team developed a tropopause-level product to allow forecasters to quickly and easily identify these dry air intrusions. Dr. Berndt currently is investigating whether CrIS/ATMS soundings can be of value to better forecast complex winter weather events, such as bands of heavy snow, areas of mixed precipitation, or lake effect snow. She also is collaborating with forecasters and other researchers to develop better ways of using satellite data to forecast areas of cold air aloft (CAA). In CAA events, temperatures can drop as low as -65˚C (-85˚F). These extremely cold temperatures regularly occur at flight levels in the Arctic, and can freeze aviation fuel. The use of satellite observations enables forecasters to observe the horizontal and vertical extent of CAA in real-time and advise air traffic controllers how they can safely re-route aircraft around these areas. This is a great asset in data-sparse regions such as Alaska, which now have a reliable source for identifying CAA over vast areas that lack conventional observations. And what about Hurricane Matthew? After roaring through Haiti as a Category 4 hurricane with winds of 150 mph, Matthew hit eastern Cuba before tracking up the east coast of Florida as a Category 3 storm with winds between 111-129 mph. Matthew finally weakened to an extratropical cyclone off Cape Hatteras, NC, before being absorbed by a cold front and carried out over the North Atlantic. Thanks to the work of Dr. Berndt and her SPoRT colleagues, meteorologists, emergency managers, and the general public have more resources at their disposal to track these severe storms, a better understanding of their causes, and the ability to create more accurate forecasts to know where and when these storms may hit. Berndt, E.B., Harkema, S. & Folmer, M. (2018). “Anticipating Winter Weather with Next-Generation Satellite Sensors.” 14th Annual Symposium on New Generation Operational Environmental Satellite Systems; American Meteorological Society, 98th Annual Meeting, Austin, TX, 7-11 January 2018. GOES-R/JPSS Poster Session I: https://ams.confex.com/ams/98Annual/webprogram/Paper327502.html. Berndt, E.B. & Folmer, M. (2018). “Utility of CrIS/ATMS profiles to diagnose extratropical transition.” Results in Physics, 8: 184-185 [http://doi.org/10.1016/j.rinp.2017.12.006]. Berndt, E.B., Smith, N., White, K. & Zavodsky, B. (2017). “Development and Application of Gridded NUCAPS for Operational Forecasting Challenges.” JPSS Science Seminar, 23 October 2017. JPSS Science Seminar presentation. Berndt, E.B., Folmer, M., Halverson, J. & Dunion, J. (2017). “Utility of NUCAPS Retrieved Profiles to Diagnose Extratropical Transition.” 13th Annual Symposium on New Generation Operational Environmental Satellite Systems; American Meteorological Society, 97th Annual Meeting, Seattle, WA, 22-26 January 2017. Utility of NUCAPS recorded presentation. Berndt, E.B., Zavodsky, B.T. & Folmer, M.J. (2015). “Development and Application of Atmospheric Infrared Sounder Ozone Retrieval Products for Operational Meteorology.” IEEE Transactions on Geoscience and Remote Sensing, 54(2): 958-967 [http://doi.org/10.1109/TGRS.2015.2471259]. Berndt, E.B., Folmer, M.J. & Dunion, J. (2014). “A Comparison of the Red Green Blue (RGB) Air Mass Imagery and Hyperspectral Infrared Retrieved Profiles and NOAA G-IV Dropsondes.” 10th Annual Symposium on New Generation Operational Environmental Satellite Systems; American Meteorological Society, 94th Annual Meeting, Atlanta, GA, 2-6 February 2014. RGB Comparison handout.